The Araceae is the aroid family, an important group of mostly tropical monocotyledons with 105 genera and 3300 mostly non-succulent species. The family is most diverse in the tropical New World although represented in the tropical and temperate Old World. Leaves may be simple or compound and life styles range from free-floating duckweeds (Lemna sp.) to tuberous and epiphytic species. The inflorescence is a characteristic form known as a spadix, often partially enclosed in a spathe (leaf-like bract) and is perhaps the most common distinctive feature of the family. Many aroids contain toxic or at least irritant raphides, but several genera produce edible tubers (e.g. Colocasia esculenta = "taro", "eddoes", Xanthosoma sp.) 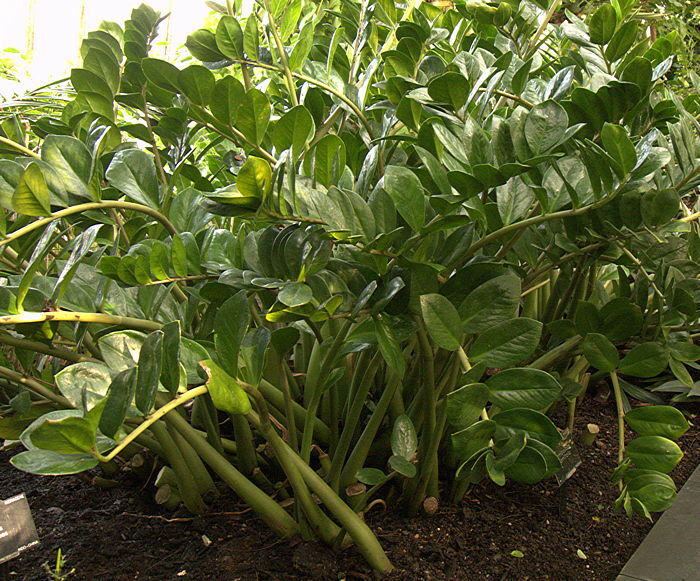 or fruit (Monstera deliciosa = "Mexican breadfruit") and are of great importance as food crops. In Medieval England the starchy tubers of Arum maculatum (Cuckoo-pint) were considered edible if well roasted although the raw plant is poisonous. Other aroids (e.g. Anthuriums, Spathiphyllums) are popular house plants and there are many choice aroids for the garden. The African genus Zamioculcas has the single succulent aroid, Zamioculcas zamiifolia. Above: the foul- smelling inflorescence of Amorphophallus titanum, showing a characteristic spadix surrounded by a spathe. Zamioculcas is monotypic for the succulent aroid Zamioculcas zamiifolia. The plants have short, thick succulent rhyzomes from which arise pinnate succulent leaves with 6 - 8 pairs of basally-thickened glossy green leaflets. The leaflets are deciduous, leaving the persistent petiole. Leaflets break off easily and can be used to propagate new plants although this can take many months. The inflorescence is a bright yellow to bronze 2 - 3in spadix with a green spathe, produced among the leaf bases in late Summer and easily missed. 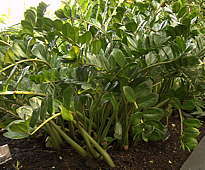 Zamioculcas zamiifolia is native to Eastern Africa including Kenya, Tanzania (including Zanzibar), Malawi, Zimbabwe, Mozambique and Northern South Africa, typically growing in moist tropical forests. It makes a very tolerant house plant, surviving low levels of illumination although bright light and regular watering is needed for it to grow well. The foliage is poisonous to livestock but the plants are used in traditional medicine.